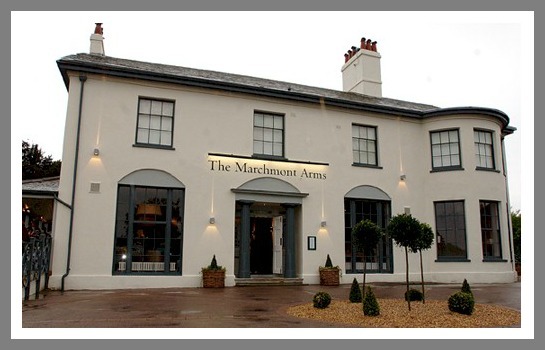 I have heard a lot of good things about The Marchmont Arms in Piccotts End, Nr Hemel Hempstead and I can't believe that we haven't visited this restaurant sooner. So when hubby took a day off for his birthday, we decided that we would go along for a birthday lunch and give the restaurant a try. We weren't sure how child-friendly the restaurant would be, but after a quick phone call to check that kids were welcome, we went along. Typically better known for their meat and fish menu options, I have always been unsure whether the vegetarian menu in this restaurant would be up to scratch and whether there would be any choices to tempt me, but I kept an open mind and decided to find out. The Marchmont Arms is an 18th century former residence which has been transformed into a country pub and restaurant. It's distinctively white fascia gives way to a traditional but modern interior with large mirrors featured over open log fires.The interior of the restaurant is also distinctively white, with wooden floors and large wooden tables and chairs. The service at The Marchmont Arms when we visited was friendly and welcoming. The staff were very attentive and were always on hand to help us. They quickly found a high chair for youngest and made us all feel welcome. After a few bad experiences in restaurants recently, it was actually a relief to be somewhere where you felt that the staff genuinely wanted to be there. So how does The Marchmont Arms fare for Vegetarians? Well there are quite a few Vegetarian dishes available on The Marchmont Arms Menu, which changes seasonally, however, my one gripe would be that non of the dishes are labelled as being vegetarian, so you have to be quite discerning to decide whether the dish you are ordering is truly vegetarian or not. Some indication on the menu would be appreciated! That said, I was surprised to find that there are actually quite a few non-meat items available on the menu, although not all of them are completely vegetarian as some of the cheeses used are not strictly vegetarian. In addition to the main menu, The Marchmont Arms offers a 2 course meal for £12.95 between 12pm and 7pm which we decided to take advantage of. The Vegetarian choices of starter from the menu were Soup of the Day, or Butternut Risotto. I decided to go for the Butternut Risotto. The Butternut Risotto was creamy and light and contained lots of flavour. 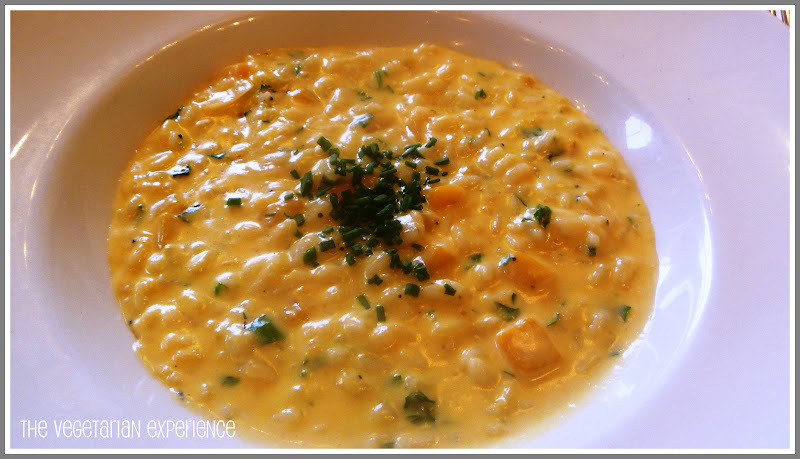 All to often risotto can be too watery or too stodgy, but this risotto was really well cooked. There were small bites of butternut squash in the dish which were soft and well cooked and I really enjoyed the dish, although I did feel that the garnish was a little dry and tainted the flavour slightly. Youngest wolfed some risotto down too and she really enjoyed it. 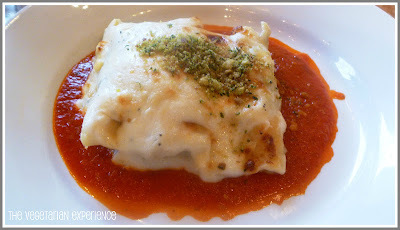 For main course I chose the Cannelloni Al Forno made with Spinach, Butternut, Ricotta, and Tomato. 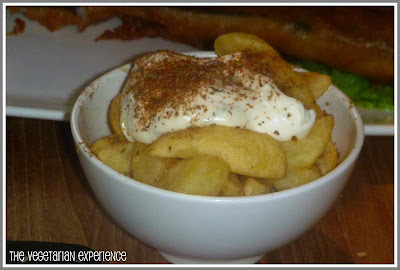 I liked the variety of flavours in the dish and I felt that the dish was well presented. The pasta was a little under-cooked in places and slightly crunchy still, but apart from that, I really enjoyed my main course and thought that it was really delicious. The other vegetarian option available on the menu was an Olive Tart, which another diner had whilst we were there. This looked very substantial and really tasty too. I chose the Belgian Frites £2.95 - Chips served with mayonnaise as a side order and youngest tucked into these along with some of my main course. To finish off we chose a dessert. I chose the Chocolate Brownie served with Vanilla Ice Cream and Dark Chocolate sauce priced £5.75. 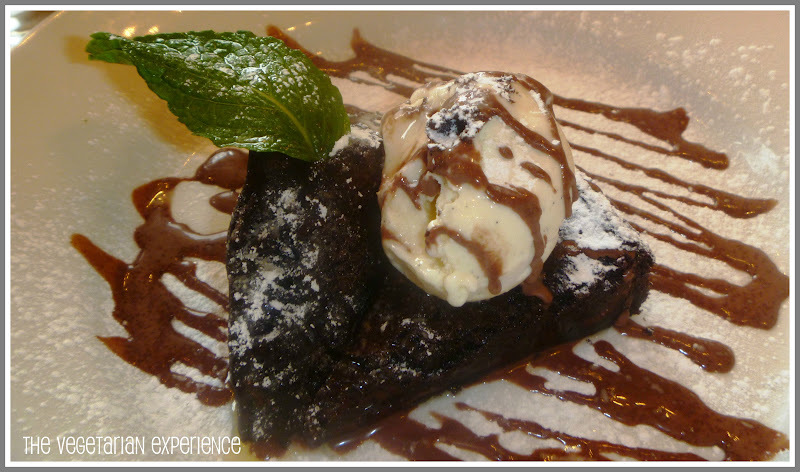 The Brownie was served warm and was light and not too stodgy. I thought my pudding was delicious and youngest, who shared it with me concurred too. Hubby went for the Ice Cream served with Hand Baked Cookies. 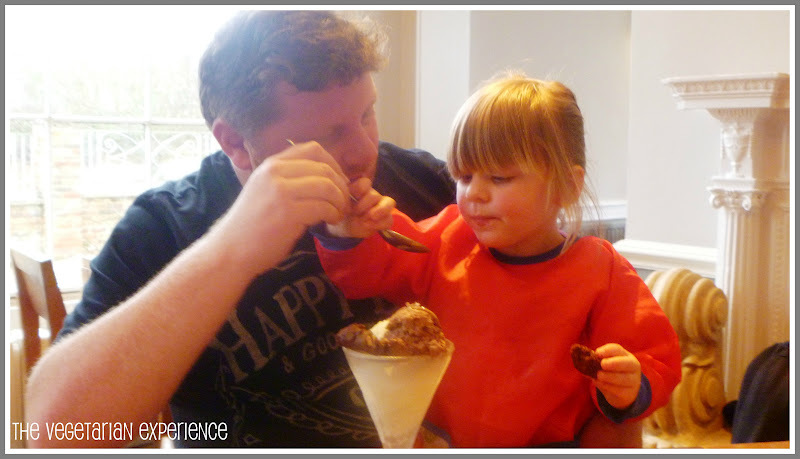 As soon as the pudding arrived, youngest decided that she wanted a piece of the action and intercepted hubby's spoon, but they eventually reached a compromise and judging by the empty bowl at the end of it, they both liked their pudding. We very much enjoyed our visit to The Marchmont Arms. The service was good, the atmosphere was pleasant and the food was really delicious. I think that the Fixed Price Lunch Menu is really good value for the type of pub you are going to. However, I would be interested to see whether my experience would be the same during a busy evening or weekend period. I would definitely visit this restaurant again and would recommend it to vegetarian friends, although I would advise them to ask for the Chef if they were not sure whether the dishes were vegetarian or not because as I mentioned before, it is not clear on the menu. I would also hope that everything was cooked from fresh and not out of the packet like some chain pubs, and if this is the case, I can justify the price of the food as I would pay a little more for food cooked from fresh, although I wasn't able to verify this either and so would be interested to find out. Price: The Daytime menu is competitively priced, as are the pizza's, but expect to pay a little more for other dishes on the menu and drinks - 7/10. Ambience: Lovely restaurant, pleasant decor, very light, clean and welcoming, I expect it would be lovely eating outside in the summer - 9/10. Service - We received very good service on our visit. The staff were welcoming, attentive and helpful. However, there were only a handful of tables in for lunch and so I wonder if this is maintained in busier periods - 9/10. Food - Apart from slightly crispy cannelloni, I very much enjoyed the rest of my food and so did hubby, He especially recommends the minted mushy peas. I would want to clarify the percentage of fresh vs frozen food to give a rank completely fairly, but based on the food we were served, I would give the restaurant - 8/10. Overall: 33 Points = 9 out of 10. 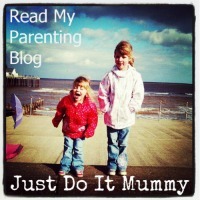 Thanks Peggy - Can't wait for blogcamp now - see you then!